Creamsicles were one of the staples my mom kept in our freezer growing up. I've mentioned several times that we're an ice cream loving family, but in addition to half gallons of cookie-dough or moose tracks, we usually could expect an array of frozen treats on hand at all times. 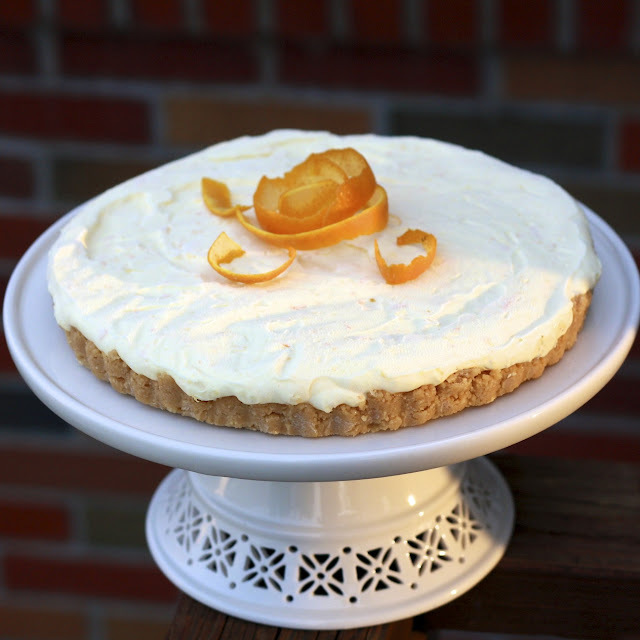 I don't think I've had a creamsicle in probably ten years, but one bite of this no-bake cheesecake and I was instantly taken back to my childhood. While mixing the cheesecake filling, I didn't think the orange flavor was very strong and I was a little apprehensive about the finished product. After a rest in the freezer, however, the creamy orange flavor concentrated and it tasted no different than the orange treat on a stick. The original recipe calls for you to make this in 9 mini tart pans. Instead, I used my large (9-inch) tart pan. If you go this route, you'll have a little bit of extra filling leftover. I have mini tart pans, so I made three personal-sized tarts with the extra. You could easily pour your extra filling into muffin tins or another small pan. This is one filling you won't want to go to waste! Cut into small slices, this was a definite throwback food for all of the guests at the Cheesecake Extravaganza! 1. In a food processor, pulse cookies until they are crumbs. Add butter and pulse until combined. (Can also do all of this by hand). Spray 9 mini tart pans or 1 9-inch tart pan with non-stick cooking spray. Press crumb mixture into tart pan(s), pressing down firmly to pack down. Refrigerate until ready to fill. 2. In a mixing bowl, beat cream cheese on high until smooth and creamy. Scrape down the sides with a spatula. Add orange juice and zest and continue to mix until evenly blended. Add heavy cream and mix until slightly thickened. Scrape down the sides, add sugar, vanilla, and orange extract and mix on high until thick. 3. Divide mixture evenly among pans (if using multiple). Cover with plastic wrap or foil and freeze for at least 2 hours prior to serving. *Can be served frozen or thawed for 20-30 minutes before served.